The European, and particularly the British, countryside is covered with sheep—which one might instinctively think of as the source of sweaters, blankets, and carpets. To an extent this can be true, but it is not well known that the vast majority of wool produced by sheep (raised primarily for meat) is considered a waste product, and is buried or burnt. Over the past few decades we’ve become increasingly aware of the vast distance between modern urban/suburban life and all its conveniences, and the rural-industrial chains by which we are supplied. The slow food movement is probably the most prevalent example of this rising consciousness. At weekend farmers markets in the middle of metropolises like New York or London, you’re more likely than not going to be able to have an in-depth conversation with a purveyor about the life of the specific animal you are considering consuming. While ethical perspectives on food have lead the way, fabric is following close behind. The European, and particularly the British, countryside is covered with sheep which one might instinctively think of as the source of sweaters, blankets, and carpets. To an extent this can be true, but it is not well known that the vast majority of wool produced by sheep (animals mostly raised in Europe for meat) is considered a waste product, and is buried or burnt. There are a number of reasons for this, and these are the basis of Pamela Ravasio’s research. The fundamental one is, as always, economic: industrial wool-processing is currently structured in such a way that it is not only cheaper to discard wool, it is the only way to avoid losing money in dealing with it. But Ravasio is looking at the relatively recent phenomenon of the mini-mill—small, highly specialised operations that can make yarn production a financially viable prospect for individual farmers. Her paper, “Mini Mills: Grass-roots service providers for Europe’s smallhold wool breeders” concludes that we are seeing the beginnings of what is likely to become a key and permanent feature of a slowly recovering—and dramatically re-imagined—European wool industry. 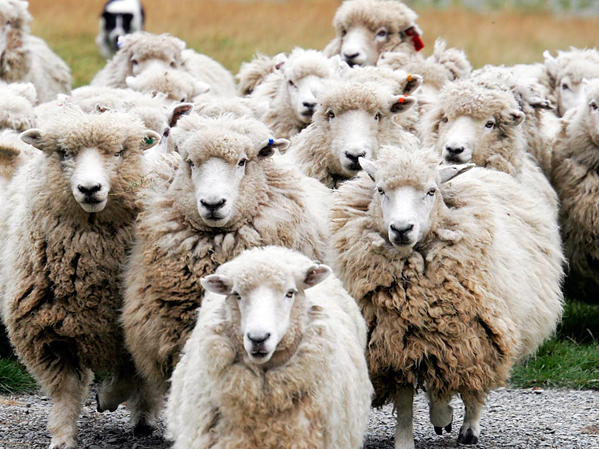 In most European countries, including the ‘traditional’ wool countries Italy, Spain, France and Switzerland, where either no legal regulation specifying how wool is to be dealt with exists, or it is barely enforced. As a consequence, wool is generally discarded, burned, buried or, alternatively, shipped to special waste landfill sites. For example, in Italy, 95 per cent of the wool is either discarded or exported – paradoxically – to eastern countries such as India or China. A mere 5 per cent is used either for insulation, carpets or handicraft (mostly felting). In contrast, the United Kingdom is a unique case in several aspects. First, a farmer needs an official waste transfer bill to move the clip, e.g. from shearing to a mill. In addition, strict legal provisions are in place for how wool is to be dealt with, the authority and legal responsibility for which lies with the British Wool Marketing Board (BWMB). However, despite a national interest in preserving wool as a resource, for the last couple of decades most wool batches in Britain, with the exception of the best qualities and largest quantities, have gone unappreciated – bought up and auctioned off by the BWMB in compliance with legal regulations. While the BWMB increasingly faces critique from a broad spectrum of stakeholders (e.g. DFF 2010), the breeders are caught in a dilemma: On the one hand, the price paid for each fleece by the BWMB is but a token, and hardly covers the costs incurred by shearing or transport (Regan 2007; Table 2 and Appendix 1). On the other, it is against the law (National Archives 1950) for breeders to simply dispose of wool as they please, and they are legally obliged to hand it over to the BWMB. In aggregating sheared wool for auction at a large scale, the British Wool Marketing Board underscores the reason most smallhold farmers are forced to consider wool ‘waste’ to begin with: the industry has been designed to deal with quantity as opposed to quality. European wool mills accepted only large clip quantities, with a minimum of thousands of kilos—quantities entirely inaccessible to them. Hence, smallholders had but few limited options depending on their country of origin. In the United Kingdom, the options ranged between handing their wool over to the BWMB while simultaneously writing off all the cost incurred for shearing and shipping at the same time, or resorting to processing the wool themselves manually due to the lack of affordable small-scale automatized equipment. In countries such as France, Italy, Switzerland and Germany, and depending on law enforcement practices, the prevailing choice was between burning or burying the wool, or paying public entities for its disposal in industrial incinerators or landfill sites (Magni 2011). As a promising case study, Ravasio cites Griffith Mill, located in Derbyshire, UK. Originally founded to cater solely for their own flock of 32 Angora goats, half a dozen Wensleydales, and the flocks of their neighbours and friends, the Griffith Mill started operation in early summer 2009. Within a few months, and only due to word of mouth, however, smallholders with pedigree sheep or goats contacted the mill from all over the country to have their fleeces scoured, carded and spun. Before the end of the founding year, the mill had a backlog of six months of operations on their books. The backlog increased to nine months over the course of the second year of operation. At the time of writing, the mill has expanded its machine park with a new fibre sorter, thanks to which alpaca fleeces can now also be processed. This additional piece of equipment will reduce the processing backlog from nine to four months. In addition to catering for an underserved market niche, the practicalities of running a smallscale wool mill require a high proficiency and familiarity with fibre qualities of a wide range of sheep breeds, as well as alpaca, mohair and angora. Such knowledge and skill is at present difficult to come by. The now emerging mini mills help the relaying and strengthening of this knowledge thanks to individuals committed to creating and finding markets for their locally made textile products, against the backdrop of a global wool market that offers no rewards, financial or otherwise, for smallholds, and in this way offers indirect incentives to create alternative and more suitable market access solutions. In addition, it is financially interesting for smallholders to take the fate of their wool into their own hands. Whereas going the official route of discarding, or, alternatively, selling their fleeces unprocessed to hand-weavers will incur a (substantial) monetary loss, the sale of knitting wool made from their flock’s fleeces could likely result in a financial gain. The quantities each of the mini mills is able to process individually are currently negligible. The picture changes, however, when the combined total amounts they are able to process as a grass roots industry are accounted for, and once the related highly skilled textile expertise is taken into consideration. In this context, mini mills play an important role in waste management and sustainability, as their service adds value to a resource otherwise regarded as waste. While this development is at present still in its infancy, there is no doubt that the mini mills are here to stay. Dr Pamela Ravasio is a consultant specializing in sustainable fashion business processes, an independent researcher and journalist. Experienced in cross-continental strategic project management, she is the managing director of texSture, a sustainability and risk advisory for the textile and fashion industry. She is also founder of the online portal Shirahime, winner of a 2011 Observer Ethical Award, the British ‘Green Oscar’. The aim of Craft Research is to advocate and promote current and emerging craft research, including research into materials, processes, methods, concepts, aesthetic and style. This may be in any discipline area of the applied arts and crafts, including craft education. The journal will portray and build the crafts as a vital and viable modern discipline that has a vision for the future. It is distinct from mainstream journals in that it is dedicated to presenting and reporting on research, in the widest sense, in order to advance the knowledge in the field. Making this knowledge, in whatever form, available to the community will help build and advance the field, and present it – in all its diversity – as a strong and essential force that cannot be overlooked. Previous post ← Tuvalu and Kiribati: Should they stay or should they go?